THE ALARM SANG, interrupting the silence that had lasted only a few hours. It was a shrill, flat song—and most mornings it wasn’t the only one. Often two or three different alarms would go off before Laura M. Sorenson (’06) rolled out of bed. 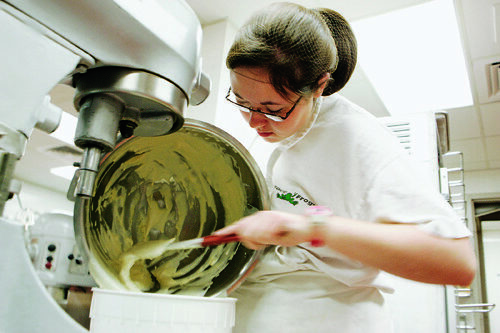 Sorenson’s job in the bakery began at 4:30 AM, when much of campus held a dark stillness. An acting major whose rehearsal schedule often kept her up until 1 AM, Sorenson needed a job to fund the study-abroad program she hoped to attend in London. Ethan L. Snyder (’06) resonates with that sentiment. 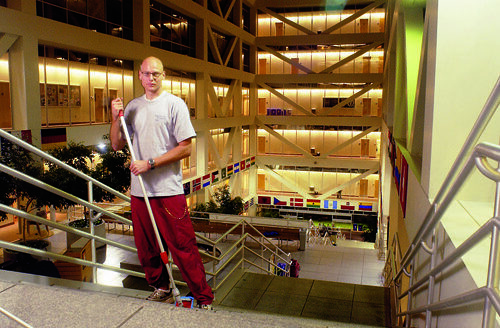 He cleaned the Tanner Building at 5 AM, glad to get work done so he could focus on academic pursuits.